The Illinois State Genealogical Society group for FamilySearch Indexing has 82 indexers, 11 of which are also arbitrators. The group has been busy indexing since the beginning of April and so far, has keyed over 150,000 records. Illinois is about 21% complete, so keep up the good work!! If you are not affiliated with the Illinois State Genealogical Society group, you can update your indexing profile. For instructions on how to do this, please visit our blog post How To Change Your Affiliated Group in FamilySearch Indexing. If you are interested in joining the effort to index, visit the 1940 Census Community Project website to get started. 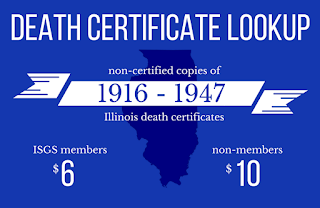 Be sure to select Illinois State Genealogical Society as your affiliated group when you sign up. Over 19 million records have been indexed and arbitrated by volunteers. To see the status of the indexing progress overall and by state, visit the 1940 Census page on FamilySearch. To ALL the indexers and arbitrators, give yourselves a pat on the back, you deserve a huge thank you!! !